Calliope (Callie) Conway doesn’t have any issues with being called a sociopath. She knows that her background would put any average killer to shame. She’s never felt any empathy towards the human race. Alaska is her homeland and, even though life in its wild lands isn’t easy, the worst part is facing her inner demons. To fight them she only has the help of Christopher and her amaroq, her animal soulmate, the oldest link between men and wolves. When Christopher Szilágyi left the American army for a job as a tour guide in the Alaskan woods, he never thought he’d end up falling in love with a psychopath whose murders he’d have to constantly avoid or cover up. However, a meeting in Manhattan with an old army colleague will force them to leave their personal issues behind while they join forces to prevent the approval of a plan that would endanger thousands of innocent lives for the interests of a few. In a world where almost all links with nature have been broken but the most primitive instincts of the human being prevail, who’s the real predator? They all hide one inside, but only some will want to control it. Recently, I had the good fortune to get a sneak peek at the ten-page preview for an upcoming graphic novel project from author Cristina Roswell. The book’s title is Woodland Creatures, and it’s based on an already published novel of the same name. Roswell’s story is set in a world just a little off center from our own. In it, there are those among us who are able to tap into their primal nature, are more in tune with their wild side. Lycanthropes, benefitting from heightened senses and endurance, are most remarkable for the bond they share with the amaroq… wolves, but larger and more intelligent than the common breed. Through this bond, a lycanthrope is able to transfer his or her conscious mind into the body of their amaroq, to take over and experience the world through the senses of the wolf. A very few are aware of the presence of these people, and unfortunately fewer still believe that while different, they are still people. Others believe that lycanthropes are too dangerous to be allowed to live free, that they should be kept under close watch until they can show that they’re in control of their wild side. Still others believe that they are a resource to be used, ostensibly, in the service of their country, pressed into military enlistment where their special attributes can be exploited. As this story opens, readers are introduced to Calliope “Callie” Conway and former Army Lieutenant Christopher Szilagyi. While the two are undoubtedly a couple, their relationship is a little unconventional by most societal standards. On the surface, Chris is bossy and overbearing, ordering Callie around and expecting her to follow his lead. For her part, Callie accepts this… at first… as the way things need to be for the moment. Being unschooled in the ways of lycanthropy, particularly where it relates to the more primal aspects of her personality, Callie defers to Chris as a “pack alpha” as much as her significant other. From Christopher’s point of view, his relationship with the wild and untrained Callie has resulted in his need to dispose of more bodies than he’s comfortable with. Hey, a wolf’s gotta hunt, right? Now, before you get too excited, Woodland Creatures (the novel) is currently only available in Cristina’s native language of Spanish… but don’t panic. The main purpose behind having her book published in a graphic novel format is to get it out there for the English reading crowd. Turns out, having a full length novel translated from Cristina’s native language of Spanish is a little more complicated than just running the whole thing through Google Translator. I have no doubt that there are many legends and myths centered in Europe, a little closer to home for you. My first question is, what got you interested in utilizing Alaska as a primary backdrop, and exploring its people’s rich and woefully unexplored culture for your story? Roswell- To be honest, I don’t think there was anything particularly special about Alaska that made me want to use it as a backdrop… at least not from the very beginning. They say there are apparently two kinds of authors: compass authors and map authors. Whereas the compass author starts their story not knowing all of it, having just established a few ideas and a general plot but not all of the details (or even the end), the map author has everything sketched from the beginning and knows exactly where the story is heading, what will happen at every point and how it will end. I am more of a compass author, and when I started writing Woodland Creatures I only had a general idea of the plot and characters. I chose Manhattan as the first scenery because I thought it worked well for the chase scene (I mean, of all the places where to get away with chasing and killing a young man with the help of your wolf, Manhattan would probably be a good choice. I was definitely not getting away with it in a small city in my home country, Spain, where everybody is out and about till late at night in the streets during the summer. Callie knows that too), and, as well as that, I had the UN headquarters which I needed for the plot. Alaska was never going to feature so heavily at the beginning, but somewhere after the first few chapters I got stuck and, after a few years, the idea just showed up and everything fell into place very easily. I always like my fantasy characters to be realistic despite the fantasy part, so I knew from the beginning that I didn’t want the shapeshifting type of werewolf. To me it felt more “realistic” (still in the fantasy genre) to be able to control the mind of an animal than to turn into him. It also felt more original and allowed me to have the wolves as extra characters (and I totally love wolves). To keep with the “realism” I needed an existing mythology as a source. I knew about the totem animals from the Native American culture that warriors were supposed to take their skills from, and while researching I found out about the amaroq (or amarok) which is meant to be a huge wolf from the Inuit mythology. So with the totem and the amaroq base I kept researching throughout the Native American mythology until I saw that Alaska and the Tlingit indigenous people were the perfect choice. The mythology (or part of it) was there and it let my characters remain in US soil (which was more practical for the story). I could have used the European mythology, as you said, but all my knowledge regarding werewolves in the European myths took me to the shapeshifting type, which I didn’t want. (Plus then the trip to the UN headquarters and back would have been more difficult, especially having to carry two massive wolves across the Atlantic!). Long story short: even though for the rest of my books I used European myths and history, I thought that Woodland Creatures would benefit more from Native American mythology. thePullbox– Another point I want to address is one that I know we’ve touched on in previous correspondence. In the urban fantasy market, there are many strong-willed and independent women at the forefront of their stories. Personally, I think your choice was a little braver in that you approached your two protagonists, Callie and Christopher, from a different angle. While there’s no doubt that Callie isn’t lacking in the will department, at the start of our story she’s a little more dependent on Christopher… but not in the way that some readers might think. She’s younger and less experienced in the ways of lycanthropy and doesn’t quite have a handle on her wild nature, while Christopher has spent years harnessing his inner wolf and learning to utilize it rather falling prey to it. As a result, Chris often comes across as demanding and controlling. How did you approach that relationship from more of a wolf pack perspective, and were you aware of potential hazards (ie: reader backlash) when you started? Roswell– Yes. I was definitely aware of potential reader backlash… and I received it, but I always had it very clear in my mind what I wanted to show, and I never let the thought of what readers might think to get too much in the way. I would lie if I said that I never think about the readers (it would be foolish not to), but I don’t let that take control when I write (and that’s probably why my books aren’t as popular as others!). For my main characters, Christopher and Callie, I wanted to show that they are not normal people, they are lycanthropes. That means that even though they are partly human, they are also “partly wolf”: they are a wilder version of human. They have a human body, so they can get hurt and they can die, but their wolf part, their wolf connection, makes them stronger, more resistant and agile, gives them a better view in the dark and a better hearing. They are basically humans boosted with wolf characteristics. However, among these characteristics there are also bits that could be not so great for a human, as they also have the aggressiveness of a wolf, the territoriality… and on top of that, you have to add the background of both characters: a military past, which makes him bossy and authoritarian; and the trauma, feeling of not belonging, detachment and superiority complex that Callie carries, which makes her unpredictable and dangerous. Christopher and Callie’s relationship isn’t perfect, and is even less perfect at the beginning. It changes throughout the book, evolving as the two of them do, but is not that of equals at the start of the story. Some readers sided with Christopher, some with Callie, but you cannot look at their relationship without keeping in mind their “wolf” characteristics and their past, secretiveness, little time they have been together for and also the age gap between them. thePullbox– Chris is a military veteran, having served in the US Army as a special forces operative. He’s seen and done things as a combat veteran, and as your story progressed it became clearer as to how that was impacting his personality. First of all, I wanted to thank you for avoiding some of the pitfalls in writing a combat veteran… too often in movies, TV, and books, writers tend to lump them into one of two categories: the mad dog killer (an apt enough description for your purposes, given the subject matter you’re writing) or the fragile broken man, both ignoring the much more subtle ways in which PTSD can affect veterans, male or female. What was your main inspiration in going a little deeper into Chris’s military experiences and how they influence his behaviors now? Roswell– I always try to be as realistic as possible, and for that I do a lot of research as well as trying to put myself in the place of the character and go by my own experiences and those of people I know. With Chris (and with Callie, as a killer, obviously) it was a bit trickier since I haven’t been in that position myself. In order to try to understand how he would feel I did a lot of research online on articles on PTSD and posts by soldiers that are dealing with that disorder. I probably also went a bit by what some movies show, as it is almost impossible to not to be influenced by what you see in those, but there wasn’t a main inspiration there as I also think that in movies the characters suffering from PTSD are too plain, just going by the two options you mentioned or actually just by saying he/she suffers from PTSD and forgetting about it half way through the story. On a personal level I have a couple family members that either are or were in the army and that I relied on for more general army related questions (like ranks and whatnot). Regarding PTSD, my boyfriend’s brother suffers from it, but I find it a bit too personal to actually go and ask anybody suffering from it, so in that sense I have just relied on the most general PTSD related stuff that my boyfriend has shared with me from his brother. As for Christopher’s military experiences, that has been up to my own imagination or based on things that I have heard or seen on newspapers (i.e there’s one scene from Christopher’s military past that I based on a photo of a group of civilians fleeing their city that I saw in a newspaper years ago). I always knew I didn’t want a perfect hero, but more like an antihero. I wanted somebody generally good, but not perfect. I wanted to show his military experience in a way that was realistic but also interesting, hence the use of flashbacks or dreams here and there, instead of fully focusing on it over several chapters. His military experiences are part of his life, and an important one, but they are in his past and he wants them to stay there. He enjoyed it for a long time, but then decided it wasn’t for him anymore when he saw it wasn’t just his life in the line but also his amaroq’s, and he started realizing that neither of them were very important for the army (or at least not for the people in charge of his special forces team). Once he came to the conclusion that those in charge in the Army only cared about the final goal and not about the means to the end, he grew out of love for it. He felt betrayed, thought that his life had been wasted there and decided to leave. I’m aware that in Woodland Creatures, the concept of the Army that I show might not be to the liking of some readers, I know that I let my own views filter through Christopher and other characters, but the truth is that I have always had a soldier of sorts as a main character in every one of my published books, and all of them are amazing people. Christopher is actually the only main character from my books that has stopped being a soldier, all the others kept being so till the end of their lives, so it’s not like I hate them or anything. I find that being a soldier is one of the most demanding careers, both physically and mentally, but especially mentally. I thought for a while that it was something admirable, but now that I’m older I cannot help focusing more on the darker (maybe more realistic?) side of it and think more about what the soldiers (and the soldier’s families) lose when they decide to give their lives (even if not always literally) for a greater common good. thePullbox– By all accounts, your novel has done very well in Europe, and for my part, I look forward to you being able to reach a wider audience in your work… I’m officially a fan. Aside from the obvious problems involved in having a book translated into a different language, what have been the considerations you’ve had to think about as Woodland Creatures gets ready to spread to a global audience? 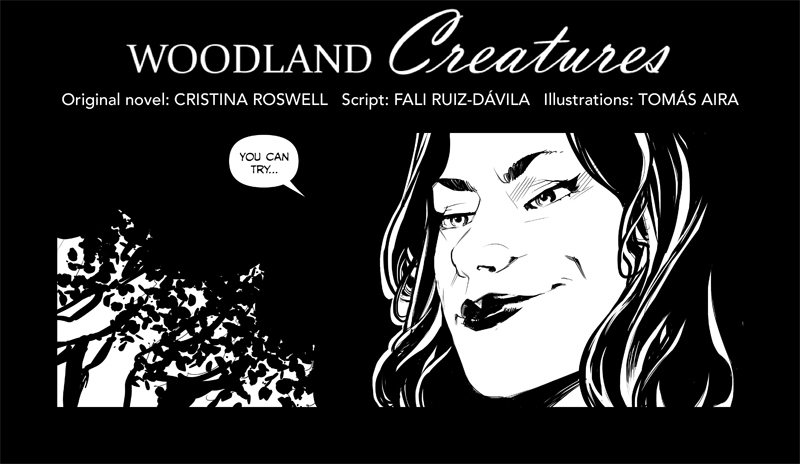 Roswell– Well, as you mentioned Woodland Creatures was originally written by me in Spanish. The main reason I started translating it into English was both so that my boyfriend (Scottish) could read it and in order to be able to reach a wider audience (especially the American and British market, which I thought might be more interested in my book due to the genre). The translation of the paperback book was time consuming and challenging since I’m not a professional translator. I didn’t publish it because I know it’s nowhere near perfect, but I still wanted it to reach more people so I decided to try with a graphic novel format instead of the translated paperback version. Even though the translation of the graphic novel script has also been done by me, less dialogues means less chances of making a mistake. I have also had the help of British director and writer David Lumsden, who has been nice enough to revise the first few pages of the translated script. But you see, it’s not just a matter of translating from Spanish into English. I also had to keep in mind the fact that British English isn’t always like American English. I had to remember where my characters come from in order to make the dialogues believable. The two main characters have grown up in America, but the mother of one of them is Eastern European and there’s another character who was born in Britain. But even when they are born in America I also have to keep in mind where exactly and how. One of the characters is from a small Alaskan village, whereas another one comes from the deep south. One of them grew up in a modest family whereas another comes from a richer one. All of that is always going to affect how they speak English, and it all gets even more difficult when your own language isn’t English but Spanish. Same speaking differences apply in Spain (varying on the part of the country and the family and neighborhood) but I’m familiar with those and not the American ones. Here’s where the help of movies, books and friends from around the world comes in handy. However, it’s not all about dialogues only, as in a graphic novel there’s something just as fun for translating: onomatopoeias (the process of creating a word that phonetically imitates, resembles, or suggests the sound that it describes. As such words are uncountable nouns, onomatopoeia refers to the property of such words)! Yup. It wasn’t until I started translating the script that I realized that it wasn’t only the dialogues and narration that I’d need to translate, but also the sounds… and yup, sounds “sound” different in English than in Spanish. Really, they do! As well as the actual translation, when you get ready to publish in another country you also have to double check that you haven’t said or portrayed some character in a way that could offend someone. I’m not talking about describing this or that skin color but more about stereotypes. Before you meet people from this or that part of the world it’s unavoidable to have a preconceived idea about them based on what you read or (mainly) see on TV. As a Spaniard, I have preconceived ideas about people from the US based mainly in movies, and even though some might be accurate, others might not, and I have to be careful and make sure I don’t fall into that with my characters. In particular, in my book what worried me the most was when it came to the Native American people I mention and their traditions. I have researched a lot but even then there’s only so much you can know without actually meeting someone or visiting a place. This is more delicate when the people you write about are still around (it’s not the same if you are writing about the ancient Greeks than if you’re talking about the current ones). And speaking of places, that’s another thing to keep in mind. I have written about places that I have actually visited, like New York and the UN headquarters, but I also talk about the village of Petersburg and the Tongass forest, in Alaska, which I have only seen in photos and visited through google maps, so there’s only so much I can describe if I don’t want to risk saying something stupid about the place. It’s quite a task being a perfectionist and wanting to stay as true as possible without having the money to travel all around the world! Still I hope I have done a decent job. 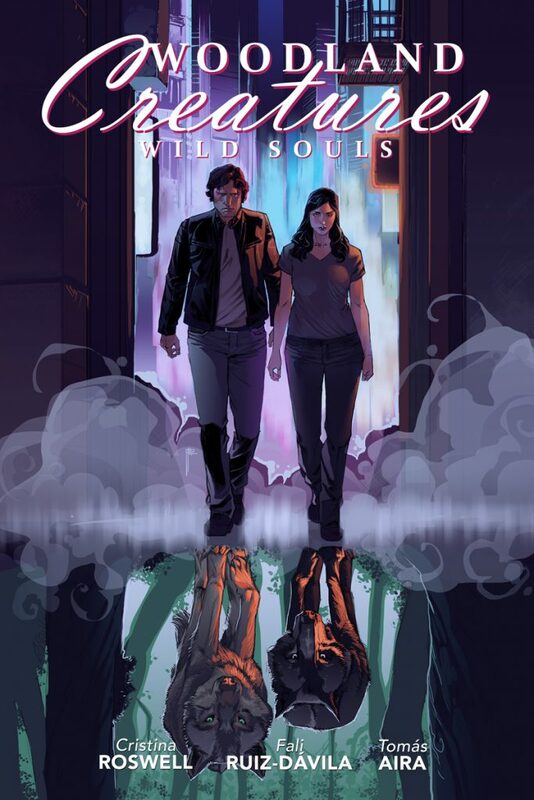 thePullbox– If it means anything, keeping in mind that I’ve read a lot of books and am a fan of this genre, I enjoyed the hell out of Woodland Creatures, and I’m looking forward to enjoying the graphic novel. Hey, speaking of that (see what I did there? ), what can you tell us about that? You’ve mentioned some of the challenges involved in making the shift from novel into comics. 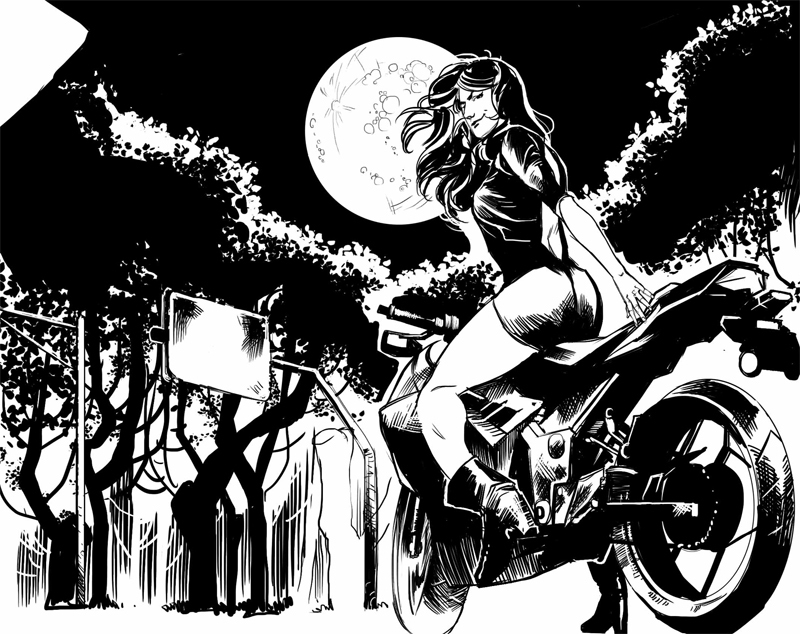 Judging by the preview pages you sent our way, it looks like you’ve definitely hit it out of the park with your artist. What are some of the more challenging details that you’ve run into while translating your book into a graphic novel? Did anything take you by surprise, or make you question your sanity? Roswell– Well, to be honest, I haven’t personally struggled with the translation of my book into a graphic novel because I hired a script writer (Rafael Ruiz-Dávila, from Spain) to do that. I know there are authors that are insane brave enough to jump from the paperback novel world into the graphic novel one without any previous knowledge, but I didn’t have the courage or time to do that myself. I do envy those who can do it, as it means having more control of your work (and saving a lot of money), but it is also exciting to be able to see your work through the eyes of someone else and it also gives you a well needed distance from it. Having someone else translate your work into a graphic novel means that the work is seen in a more objective way and the other person is able to filter it better. I think on every book there are bits that the authors keep because they are meaningful to them, but are actually dispensable and not that vital to the story. Having a script-writer means that he can do all the cutting of those dispensable bits that I probably would be too weak to leave out and select what actually needs to stay in order to keep the graphic novel attractive, interesting and the right length. A script-writer can also better choose the best way of translating the characters and their actions into the panels (views, set up, etc.) I have all of that information in my mind, but I wouldn’t know how to give the best indications to the illustrator. So far Rafael, the script writer, is doing a very good work, and he and the illustrator (Tomás Aira) seem to be on the same page, which is amazing for this project and helps with communications and the developing. So yeah, when it comes to translating my book into a graphic novel I’m pretty much just supervising the process, making sure nothing actually important is missing and offering suggestions here and there. thePullbox– I think you’ve said that your graphic novel was going to be a crowd funding project. What kind of time frame are you looking at to get that campaign going? Roswell– We still need to set a definite date for the start of the campaign, but we are looking at April or May. I just have heard of so many crowdfunding projects that don’t hit the target that I want to do some promotion to get the word out before the campaign launches. In order to do that, we’re going to be attending a few comic conventions and they are all happening around spring, hence the delay on the launching of the campaign. Once launched, we’ll probably keep it going for a month. If funded, we calculate that the completion of the project will take about a year if everything goes as planned. It might seem like a long time, but we’re talking about a complete graphic novel that will be around 120-140 pages long. thePullbox– I’ve spoken to enough writers to know that there’s always something bouncing around in the brain box. Do you have any other plans, thoughts, or ideas that you think you’d be able to share? Anything we can look forward to from you in the future? Roswell– I always have something “bouncing around in the brain box”, as you say, yes. The main problem for us authors who aren’t currently making a living out of our work (and hence need a “secondary” main job) is the lack of time. But yeah, even though I cannot give “dates” I already started working on a sequel for “Woodland Creatures” (I’m about 40 pages into it) and have a few ideas which are just pretty much “mental sketches” as I haven’t started on with them. At the moment I’m focusing on the graphic novel and unfortunately that means having to take time from future projects, but there’s just too much to do and I’m too much of a perfectionist! Roswell– That’s a really good question that I have never been asked before. When I was a kid I actually used to write sequels to movies that I liked back then, that’s what got me into writing. I started a sequel (or more of an alternate universe) for The Fellowship of the Ring where Boromir lived. That probably would destroy the rest of the story but hey, he was always my favorite character so it would have been a worthy sacrifice! I also did an alternate ending for the movie Troy (yeah, I know, but I was young!) and a sequel for The Mummy (the first one, obviously). I have refused to read them recently as I remember they were your typical Mary Sue story and I’m too embarrassed to go through that! But anyway, I have been thinking about your question since I received the interview and I think that, nowadays, writing for the Doctor Who series could be as challenging as fun. I honestly don’t know if I would take the gig as the bar is set extraordinary high and we Whovians can be quite demanding, but it would definitely be interesting to think about. Other than that I also think a Black Mirror episode would be great fun to work on as the possibilities are infinite. thePullbox– If you have anything else that we haven’t talked about, something you’d to put out there into the world for all (well, for my tens of readers) to see, now’s the time for a shameless plug… Whatcha got? Roswell– I think you have done an amazing job with this interview, so I can’t really think of anything else interesting enough to say. I’ll just take the opportunity to thank you for your interest in my book and the graphic novel. I have really enjoyed reading your thoughts about my work and taking the time to thoroughly think the answers to your super elaborated (in the best of ways!) questions. I really hope your readers have enjoyed this interview at least half as much as I have enjoyed replying to it! thePullbox– Cristina, I just wanted to thank you again for reaching out to thePullbox. It’s been great chatting with you and getting a look at your work, and I very much look forward to hearing from you in the future. Hope 2019 brings you success and satisfaction.